“The generation of number series is related to objects of geometry as well as cosmogony. From the Monad evolved the Dyad; from it numbers; from numbers, points; then lines, two-dimensional entities, three-dimensional entities, bodies, culminating in the four elements earth, water, fire and air, from which the rest of our world is built up.” Chevel’s command of his sound palette is flawless: Monad I seamlessly contorts from elegance to malevolence. The incremental changes, readings, measurements, observations are collected and clustered together. The EP forms a log of four experiments into texture, timbre, tone. It’s geometric techno. It’s violent subaqueous dub. It’s stratospheric ambience tangled amid whispy white noise. Chevel’s just 19 and he’s that moreish combination of low profile and high quality. Len Faki 5 out of 5. 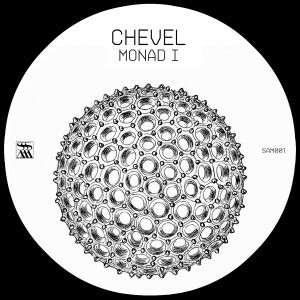 Looking very forward to the Monad series, great start! Laurent Garnier Dark, strong and moody Lovin' it. Jonas Kopp 5/5 Excellent, brillant, amazing, awesome! This is what i am looking for to play out. Electric Indigo 5/5 Love it! love the raw techno vibe, and i love toms anyway :-) all tracks are great! Dario Zenker 5/5 Amazing and sweet techno. Love it. Philip Sherburne (The Wire) It's pretty damned sweet! Very focused on a single idea, but really immersive at the same time. Resident Advisor Really hypnotic and grooving. The entire EP is a beast, though. Quite impressive for such a young producer. Illectronic Beautifully simple, balanced and brutal. A nice way to kickstart the new series.